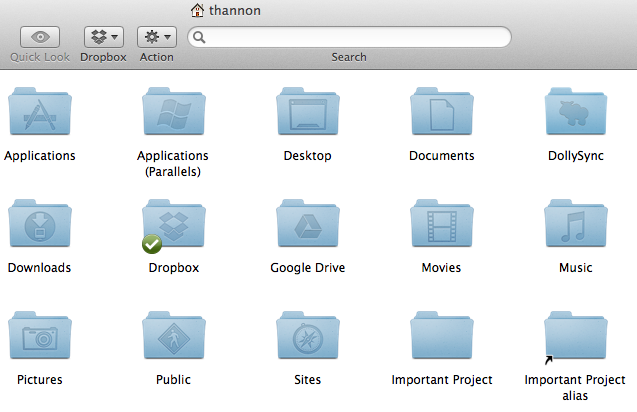 Have you ever wanted to have a folder appear in two places at once on your Mac? If so, you should know about creating aliases. An alias is a pointer, or shortcut, to the original folder. An alias looks like the original folder, but when you double-click it, the original folder opens. When the Finder window appears, select one of your folders by clicking on it once (not twice). Go to the File menu and select Make Alias. The alias appears right next to the selected folder. You can identify it as an alias by the little black arrow in the lower left corner of the folder icon. Also, the word alias was appended to the folder’s name. See the picture below in which I created an alias of my Important Project folder. Now drag this alias to your Desktop, or any other location on your Mac. You can rename it to remove the word alias, if you’d like. Test the alias by double-clicking its icon. You’ll see that you opened the original folder! You can create aliases of both individual files as well as folders. This way, you can make the same file appear in two or more folders. Read more about alias, instructions, shortcut.